"artan has become the main symbol of Scotland and Scottish Culture. It is an emblem for those of Scottish descent around the world. With Scottish National identity probably greater than at any time in recent centuries, the potency of Tartan as a symbol cannot be understated. There is evidence that Celts have used striped and checked material for thousands of years. The Scoti, who settled Western Scotland from 5-6thC onward and eventually gave the whole country their name, are said to have used striped garments to signify rank. One possible derivation of the word Tartan comes from the Irish tarsna - crosswise & Scottish Gaelic tarsuinn - across. The basis of the pattern, dress style and word may date back to the time when the Scots introduced their Gaelic culture into what was to become Scotland. If early Tartan, like the Gaelic language, were used across Scotland in the 10thC, by the 13thC it would have been confined to the Highlands. Lowland Scotland began adopting the language of the northern Angles and Norman social structure from the 12th Century. The battle of Culloden in 1746 saw the end of Jacobite claims to the throne. Many Highlanders, but by no means all, had backed the losing side of Prince Charles Edward Stuart. The great importance of Tartan and associated dress to Highland Culture at this time can be deduced from the fact that the government banned it from 1746-82. This proscription however applied only to common Highland men - not the upper echelons of Highland society, not to Lowland Scots and not to women. But most importantly, it did not apply to the Highland regiments that were being formed in the Government army. The new regiments were mainly associated with specific Clans, containing the men of that Clan and often led by the Chief or a senior member of his family. The first regiments used the 'Government Tartan', the Black Watch, but others quickly adopted distinctive new patterns. 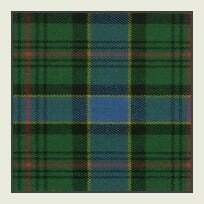 From this it appears that specific regimental Tartans became Clan or family Tartans and not vice-versa. The variety of Tartans has never stopped growing. Many Clan Tartans have become available in ancient, modern, weathered, dress or hunting. Almost every surname from the British Isles has been associated with a Clan and their Tartan. People's wish to wear 'their' Tartan has been enthusiastically meet by manufactures. Companies, organisations and even sports teams have their own Tartan. We provide three different products as part of our Tartan graphics portfolio. Mix and match the options to suite your needs. Our instant download product will be delivered to you shortly (less than 24 hours) after purchase and contains a minimal color scheme much like the preview image. Our enhanced download product will be personally touched up by our studio graphic artist before delivery resulting in a full color rendition of the design image which is 3.5 inches by 5.0 inches. If you require an extra large version, we can provide up to 60.0 by 72.0 inches, just select from the dropdown menu. If you require a larger size then this, please contact us for a custom quote. Enhanced download designs are rendered in glorious 24k for maximum color and resolution. We can provide our download products in GIF, JPG or PNG formats for maximum compatibility. A transparent background is standard for GIF and PNG formats. Our design products are perfect for school projects, letterhead, email, website, newsletters and brochures. No shipping charge for this item - you will have instant access within several hours or it will be sent to you by email within 24 hours depending on the product you choose.